because it's no more Ecuadorian than Peruvian. And that's the way they like it. 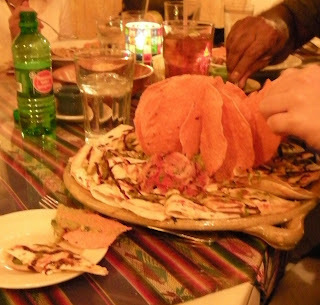 Rolando's in Hot Springs is about far more than the cuisine of one South American culture. It embraces them all.Rolando and Sherri Cuzco's eatery moved in to the vacant spot on Central Avenue when the Faded Rose moved out a few years ago. 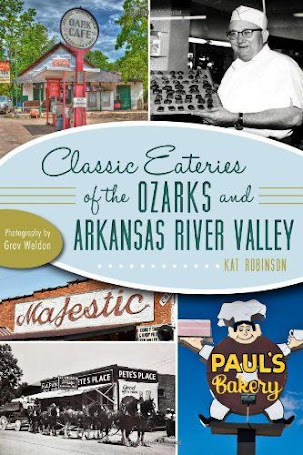 This and their location in Fort Smith serve up similar fare -- but it's all good, and most of it has a bit of a bite to it. The large group I was with came in to welcomes, hugs, and bowls of a lovely black bean and corn salsa. 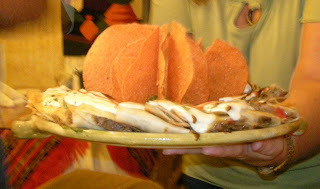 Crispy thin tortilla chips roosted in bowls along the table, but I wasn't going to fall into that trap. I know better. There lies the road to filling up too quickly. what fusion cuisine is all about. "You know what they do on Food Network when they blend a lot of influence? We're doing it right here, with our fusion cooking." Carribean, Creole, Cuban... there's a hint of it all in the menu and on the plates and certainly in the fragrant air of the little restaurant. Our gathering party was looking for finger food, and the Cuzcos obliged with bite sized specialties that looked innocent enough -- until you took a bite. Rounds of quesadillas emerged from the kitchen, plenty for all -- thick dark pork, colorful vegetable, smooth chicken, and my favorite, the Quesadillas de Chivo -- a tangy and sharp goat cheese quesadilla striped with red and brown chipotle sauces. Incredible. Sherri told us we were doing ourselves a disservice if we didn't sample the guacamole, and she was right. 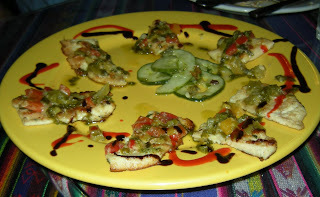 Rather than the homogenous paste often encountered at Latin-influenced restaurants, here it was obviously housemade with large fresh chunks of avocado, light on the spices. The avocado is really allowed to shine. And well it does, both on its own and as the perfect counterbalance to the spicy and citrus flavors in the rest of the food. 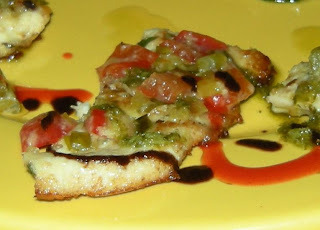 While the quesadillas were a hit, they were no match for the other fine foods -- especially the Pollo Bohemio, delicate chicken tenders marinated in mojo, sauteed in a lime and wine sauce. These delicate morsels melted as chicken usually gets the chance to on the tongue, perforated with the tart of lime but still somehow sweet and savory. Another favorite -- Camarones al Moho, fantastic firm shrimp in lime wine sauce with tomatoes and veggies over rice and beans. The shrimp seem somehow buttery in texture and not rubbery or overcooked. As often happens when great conversation meets good food, there was much overindulgence to be had, and I had to pass up on the fabulous desserts I'd been taunted with before our visit. I did promise to return on a subsequent visit to try Rolando's Bananas Heaven in a Bowl, a delight that I was told was somewhere between Bananas Foster and manna. Fortunately, Hot Springs isn't a far wander from home, so hopefully I will be back soon. You'll find Rolando's Nuevo Latino Restaurant in Hot Springs at 210 Central Avenue, and at 223 Garrison Avenue in Ft. Smith. For more information, check out the website or call (501) 318-6054. Yes, reservations are accepted. And though I missed out this time around, next time I'll check out the patio out back -- right next to a 60 foot natural stone wall that's supposed to be strikingly beautiful. Can't wait to go back. Some things change, some BBQ remains the same, but that's a good thing. Restaurants come and go. They may last a week or a decade. A few manage to eek out a couple of generations. But one institution in Hot Springs has been going strong for 80 years. Of course, that'd be McClard's. To be completely honest, if you took a trip back in time you wouldn't find this restaurant sitting here in 1928. Back then the original McClards, Alex and Gladys, owned the Westside Court Motel a few blocks down Albert Pike (though it wasn't called Albert Pike then, but I digress). They'd take on lodgers -- and they had one who stayed with them two months. But when it came time to settle the bill, he wasn't able to come up with that $10 he owed. Instead, he offered them the recipe for what he called "the best barbeque in the world." They took him up on it, called it a fair trade, and let him go. Turns out, that was a momentous decision. The happy couple reopened their motel as Westside BBQ, and they smoked their meat of choice -- goat! No, goat's not on the menu today. The family moved the operation to its present day whitewashed building in 1942, where it operated with carhops who'd come out and take your order when you honked the horn. You could even drive up and tune in to the jukebox with your car radio. Waitresses would bring out drinks and ribs and fixins on a tray that attached to your window. Things change, of course. By the time I entered the picture as a babe-in-arms in the early 70s, there was a dining room and a long line of barstools across the front at a lunch counter. My folks would take me and we'd find ourselves a booth and munch down on a plate of tamales or a rack of pork ribs together. We all age, don't we? And sometimes memories fade into the black, only to come back with a scent on the wind or a hearty bite of something between the teeth. Strangely enough, it wasn't the call of barbeque that called me back to my past on my recent visit. I was traveling with a group of new companions who weren't familiar with Hot Springs recently. We dropped in on a Wednesday afternoon with appetites and curiosity. It felt sorta like introducing old friends to new ones. We sat down and perused the menus. One of my tablemates, a confessed vegetarian (bless her heart) decided she'd give a little and try some of the pulled pork with her side orders. It's the same dish Mr. Clinton gets when he comes to town -- pork, beans, and slaw -- though Mr. Clinton usually forgoes the bread since he's watching his weight. The Encyclopedia of Arkansas records the former President as the only person the menu has ever changed for, and the only person the restaurant will accept a reservation from. Well, I can't fault them there. 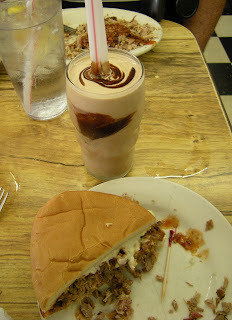 I decided on an old favorite pairing... and went for a barbecue beef sandwich, tamale, and chocolate malt. 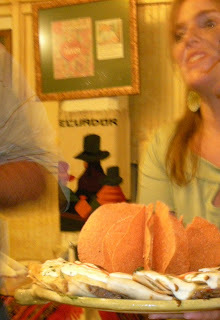 I know, I know, I can't eat the tamales -- but I can gaze fondly on them, and at $2.90 each it's worth the memory. Besides, there were plenty for me to share it with and experience it vicariously. McClard's tamales aren't like anything you'd ever know anywhere else -- they're particularly of an Arkansas breed. No corn sheaths here -- just a core of shredded pork, within a hand-formed tube of cornmeal mash, served with saltine crackers. Yeah, some folks eat them with a fork, but the locals use the crackers to scoop it up, and some of the oldtimers even still wash it down with buttermilk. for service at a table it's always been Ms. Wyona. She's been there about as long as my mom's been alive, and she's still amazing. She can take a table full of orders without a notepad, remember it all, get everything right -- and she's still doing it today. She's at least 80 and still going strong. 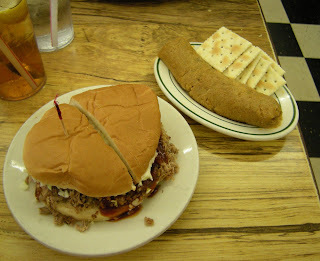 She came over and refilled my iced tea and slid a couple of plates on the table in front of me -- the aforementioned tamales and the chopped beef sandwich served the way we do it in our state -- at least, those of us from here who know how these things are done. Beef is chopped after it's smoked, then layered onto a fresh bun with mayo, chopped cabbage, and sauce. That cabbage and mayo combination is usually replicated elsewhere as slaw, but since the slaw here is good enough to eat by itself this will do. It's cut in half -- has to be, since handling more than a half at a time is begging for disaster. As it is, a napkin from the box at the inside end of the table is a prerequisite. You just make sure you pick up the napkin before you start chowing down on that sandwich. Moments later, Ms. Wyona had brought out my chocolate malt. I know people who don't order malts because they're "chalky." I doubt they've ever tried the malt at McClard's. No, it's not big -- and anyone who tries to pressure you into getting one of those 32 ounce monstrosities at some place or another doesn't know what they're talking about. Better than that, they're not full of air -- so what you get in your glass is just creamy rich milk, ice cream, chocolate, and malting -- smooth and gentle and the perfect bit of calm to ease your taste buds out of shock. 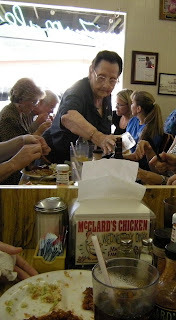 Because, though McClard's sauce isn't hot on the way down, a few minutes after you start to feed you'll notice a sharp wang of spice building up. Hence the popularity of dairy items on the menu (buttermilk, milk, chocolate milk, ice cream) and the need for beer (a bottle will run you around $3). It's hard not to go into a food coma with something as good as all that. I watched with a bit of disengagement as Ms. Wyona brought out plate after plate for others -- rib plates that were a feast for the eyes with those ruddy red smoke stained bones amid a pile of fries; pork and beef plates with their triangles of light green cole slaw and deep red beans (the beans lean far further towards the Mexican side than the pork-n-bean side), glasses of Coke and plates of tamales. Me? My tongue was dancing with the kind juxtaposition of cool cabbage, creamy mayo, spicy sauce, and that deep smoked pink ringed beef. Between the sandwich and the perfection of the chocolate malt, I was whipped away in bliss. And apparently, so were my traveling companions. Remember the lady I mentioned was a self-confessed vegetarian? This is her plate, after the hunger was satisfied. No, I was in no position to help her, but she did mighty fine by herself -- so fine, in fact, that we conspired to pick up a dessert, too. 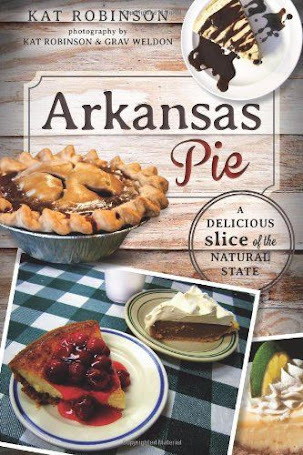 And what dessert cries out "Arkansas" more than cobbler? She ordered the blackberry, I ordered the peach. One of our other dining companions ordered the Key Lime Pie and declared it good -- high praise from someone who's likely tasted Key Limes in the Keys. 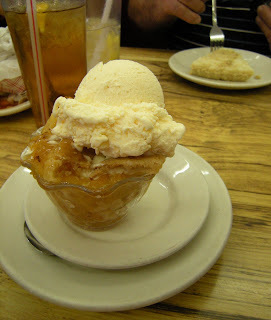 I was all about some peach cobbler -- lightly spiced with layers of crumbly dough in-between. Heavenly. The current co-owner, Scott McClard, dropped by to talk with the folks who had congregated in our area, and to answer questions. He's fourth generation, and his girls might one day join in the business, too. Of course, they're in their teen years, so there's plenty of time. If you go, know a couple of things. Chicken is only served on Wednesday -- otherwise, it's beef or pork. Shake on a little of the McClard's dry seasoning on everything for a try -- it's a great little extra kick. Don't bother coming down on Sunday or Monday -- no one will be there. And wash your hands -- the restrooms are around the back on the east side, and they're clean and neat. McClard's is open from 11 a.m. to 8 p.m. Tuesday through Saturday at 505 Albert Pike in Hot Springs. 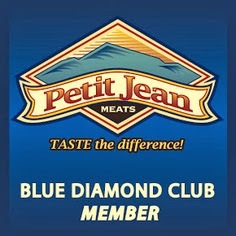 If you're in a real rush and want to grab your meat on the go, you can call (501) 624-9586. And if you can't make it at all, order your sauce off the website. October… that lovely time of year when the scent of burning leaves fills the air. It’s worse if you’re in Northeast Arkansas, where the fields are burned off. 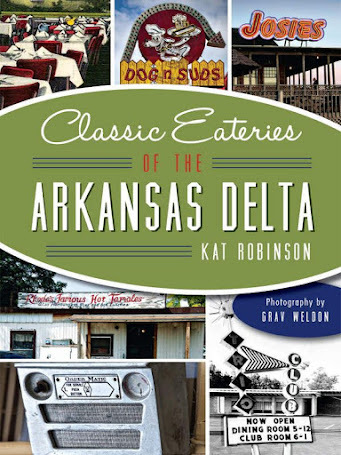 But in Little Rock, you can be just about anywhere and catch a waft of funnel cake or fried meat drifting by. It’s State Fair time, and that means time for food. But what can you find at the fair this year? 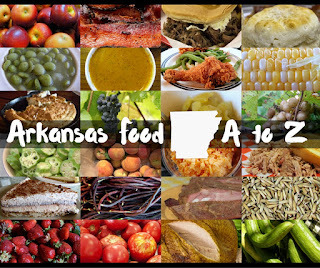 All sorts of strange and unusual stuff, things you’d never try in a restaurant but might be apt to try at the once a year extravaganza known as the Arkansas State Fair. Take, for instance, the Pig Licker. No, not a reference to someone’s sexuality or penchant for fetish, but a real honest to goodness dish from the Minnesota State Fair, where it debuted in August. 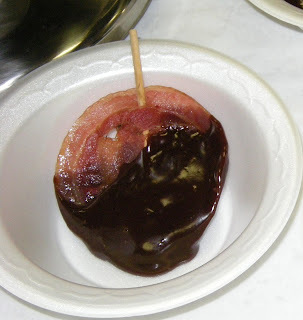 Famous Dave’s paired up with Cargill and Wilton Chocolates up there to come up with the original -- sticks of apple wood bacon dipped in dark chocolate and sprinkled with sea salt. Here in Arkansas, the fair folks are doing it a bit differently. Instead of cold bacon and its Magic Shell-like chocolate, bacon rounds are threaded onto sticks and dipped in a rich milk chocolate sauce. The combination of sweet and salty is sure to turn heads this year. 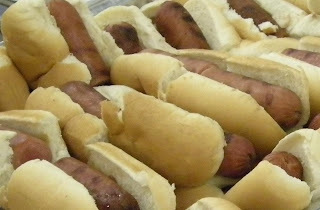 Another unusual entry at this year’s fair -- deep fried hot dogs. Seriously. 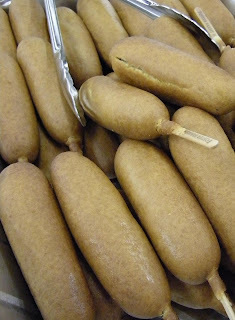 No, not corn dogs (which can be found hand-battered and fried along with all sorts of other foods in the vendor section of the fair) but hot dogs directly applied to hot oil. The result is an exploded dog served up on a bun. Sorta like when you decide you’d like to have a hot dog at home but decide to stick it in the nuke instead of going through the trouble of sticking it in the oven. New also to the fair this year -- boiled peanuts. They’re big out East, but around here chances are you get your nuts roasted or toasted. 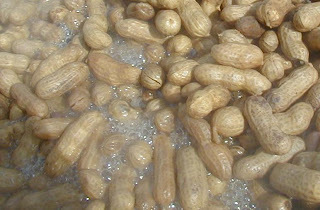 Boiled peanuts are considered a delicacy by some. To me, they’re like eating something a bit softer and wetter than a Macadamia -- I’m just not that big a fan. I’ve been perusing the official list of foods from the Fair folks that contains what’s new and what’s tried and true. I was quite surprised to see Mozzarella Sticks on the new list. We’ve all had them, right? Sometimes they’re pretty good -- when they’re cooked the right amount of time. Sometimes, especially late night in your favorite bar, they can come out absolutely hollow after being left in the oil a bit too long. Another new entry this year is cheese nuggets -- big lumps of cheddar cheese that have been battered and deep fried. This savory something comes from Wisconsin (no surprise there) and will fill you up quick. Not for those who can’t tolerate a bit of grease. A new favorite of mine is making its debut at the Fair this year -- T-Ravs, as they’re known in St. Louis. 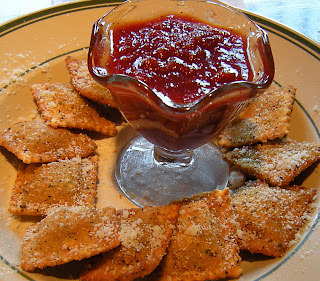 Toasted ravioli is very popular up there, but hard to find south of the Missouri border. An Italian food vendor is coming down to share T-Ravs, toasted cannelloni, Italian Sausage on a Stick, and Meatballs on a Stick with us. T-Ravs are best served hot with a cool pool of marinara for dipping. I’m assuming that toasted cannelloni will be similar -- cannelloni in itself is usually a long thick tube of cheese and/or meat. I suppose they’re going to cap the ends somehow. Meatballs on a Stick seems like a no-brainer to me -- sort of like Italian shish-kebab. 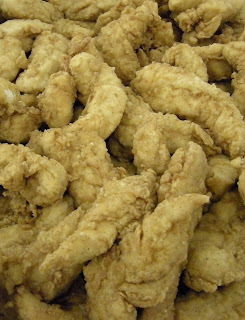 Of course, that’s not all you’ll find deep fried at the Fair this year. Though Arkansas’ big event tends to be a little less fried than, say, food row at the Texas State Fair, you can’t throw a T-Rav without hitting something fried. On the heels of the ever popular Fried Coke comes Fried Dr. Pepper. 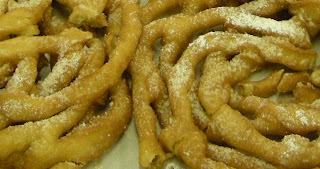 The batter is similar to what you’ll find in a funnel cake; the big difference is that the liquid in the recipe has been replaced with Dr. Pepper. The dumplings of Pepper-dom come doused with a little Dr. Pepper syrup and topped with a bit of whipped cream. Another entry into the “I can’t imagine why they needed to deepfry that” category -- Deep Fried Chicken Fried Steak on a Stick. That takes some getting your head around. I’m having a hard time even picturing it. I wonder if it’s served with gravy. Most of this sort of unique food is coming to the Fair via vendors who travel from fair to fair, selling neat and new ideas to people who have never tried such things. But the State Fair folks have a few ideas of their own. They’re operating the Corner Café -- a pavilion opposite the Hall of Industry where you can find all sorts of Arkansas-inspired delights. Big on this year’s menu -- deep fried jalapenos and dill pickles. They’re also serving up whole fried catfish filets, jumbo fried chicken tenderloins (apparently from jumbo chickens? ), and jumbo frog legs -- apparently larger than your average drumstick. I wonder if Kermit knows. One more Fair folk entry into the fried food arena -- fried hot wings. Rounding out other fried foods at the Fair -- the Southern classic, Fried Green Tomatoes. I wonder how the tart tasting veggies will sell alongside all those other offerings. One food Lyons told me about did give me a bit of a boost -- an idea that seems natural to me, but a bit tastier and healthier than the traditional Fair food. This year, you’ll be able to find Sirloin Burgers not far off the Midway. These hand-patted fresh ground creations have never seen a freezer. “It’s fresh ground from the steak, which is good stuff,” Lyons says. I believe him. Cooked to order fresh burgers sound remarkably good even now. Another cuisine that’s making a comeback this year -- Mexican. One of our local chains used to run a concession at the Fair, but that petered off in recent years. This time around, jumbo tacos and burritos are making their debut, along with chimichangas, which have never been done at our fair before. Sounds like most of the stuff I’ve mentioned just couldn’t be healthy for you, right? Well, guess again. Strawberry Smoothies are coming in -- lots of fruit, lots of dairy, the perfect thing to wolf down with your chili dog before jumping on a ride. There are also beef and chicken kebabs, rosemary chicken, gyros, and taco salads. So even those with an aversion to things that are deep fried or battered have some options. But for most Fairgoing folks, eating out at the Fair is about excess. You can see it in the two and three foot long specialty corn dogs, the ginormous turkey legs, the massive Bloomin’ Onions and Hub Cap Burgers. You can taste it in deep fried candy bars, in hot fudge cakes, in new entries such as the Italian Pot Roast Sandwich and old favorites like overloaded plates of nachos. over. 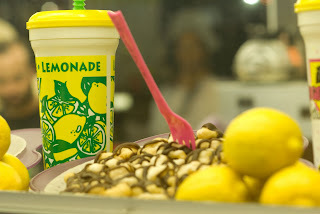 Nut rolls, candy and caramel apples, Frito pies, ice cream (and the ubiquitous Dippin’ Dots) are still around, as are the massive tall cups of fresh squeezed lemonade. This year, there are even people selling barbeque ribs. Screams of Memphis, doesn’t it? Lyons seems pretty excited about all the new foods coming into the Fair this year. He knows what it’s all about. “The thing about fair food, the uniqueness -- it’s stuff people won’t try at restaurants.” And he’s right. Our state fair is a chance to throw caution to the wind. It’s 10 days out of the year when diets go right out the window in favor of a chance to sample something unique and different that you’re not going to find on the menu at your local restaurant, stuff you aren’t willing to waste money on experimenting with at home. Never mind that the fried Oreo you’re about to bite into is loaded with calories -- it’s something different, something to entertain your palate as you’re overloading your eyes and ears on the exhilaration of a once-a-year happening. So what if you gain a few pounds? It’s the beginning of a cycle -- we start pigging out at the Fair, then gorge ourselves on Halloween candy, fight our way to the juiciest part of the bird at Thanksgiving, wallow in chocolates throughout the Yuletide season and drown the old year out on December 31st. Perhaps it’s our way of preparing ourselves for the coming winter, putting on those extra stores of fat to keep us warm through Arkansas’ brief but sometimes bitter cold season. Or maybe, just maybe, it’s our way of celebrating a great and bountiful harvest in a modern way, enjoying the crops of fertile minds who enjoy dipping things in chocolate or batter and seeing how people react to the uniqueness of it all. There’s not a bit of telling. We all have our reasons for the Fair-time pig-out. It’s best sometimes just not to think about it too much. The Arkansas State Fair runs October 10-19 at the State Fairgrounds in Little Rock. Check out the website for schedules and the like. Fair Warning: Fun With Food At Arkansas State Fair. Warning -- this entry contains bacon. The Arkansas State Fair holds a special place in my heart. When I was a little girl, the Fair always seemed to fall on my birthday (October 4th), and many years I celebrated on the midway, weaving my way from ride to ride on one of the wristband nights, trying to find the most outrageous things to do, see, and eat. I suspect there's a little girl out there somewhere who's looking forward to trying the neat new things at this year's Fair... but there are some things that scare even me. 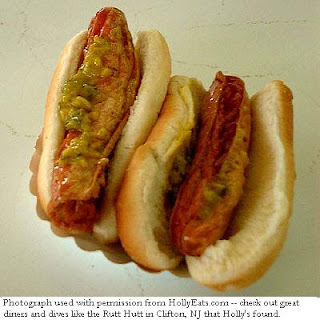 Just got a preview of what food you'll find at the Fair this year from Tom Lyons. He's the food dude, the Director of Food Services at the Arkansas State Fair. He's the man in the know about what vendors will be selling. And he has big news. "One of the things that is new this year is the Pig Licker," Lyons told me. Pig Licker. That's not the most polite of names. In fact, I'm a little scared. Turns out, I should be. "What it is, is chocolate dipped bacon. It was new this year at the Minnesota State Fair. 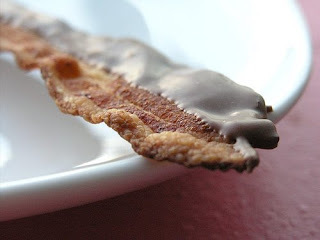 Basically, it's bacon you dip in chocolate, like chocolate covered strawberries." So I had to go do some research. 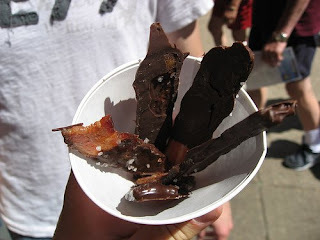 According to an article in the Minneapolis-St. Paul Star Tribune, Pig Lickers are strips of bacon covered in dark chocolate and sprinkled with sea salt. The Arkansas State Fair version is a bit different. 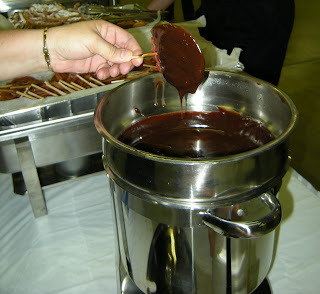 Instead of the Magic Shell-type chocolate on strips, bacon rounds are dipped in melted chocolate. I got to see a special preview of the Fair the second week of September, and most folks took one of the lollipop type confections. However, when I went around and looked at different tables, I noticed a lot of people talking about them -- but not a whole lot of people trying them. 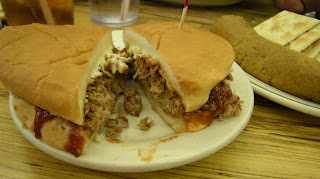 The general consensus from those who tried Pig Lickers -- it was either an instant love or an instant hate. There was really no in-between. I regret that my allergies prevent me from sampling such an, um, epicurean delight. Many of my friends talk about bacon being the "candy bar of meat." I remember bacon being one of my fondest foods as a child and a teenager. I used to love the BTT -- forget the lettuce, just a couple of fresh thick slices of homegrown Arkansas 'maters, a couple of super crispy slices of bacon, a dash of Miracle Whip all sandwiched between a couple of slices of toasted slices of white bread. You had to either eat it over the sink or wrap it in a couple of paper towels, but oh -- what a summertime memory. Still, the idea of marrying bacon and chocolate doesn't seem so far-fetched. After all, many of us enjoy chocolate with nuts or a good salty trail mix with chocolate chips. It's the salt factor. Any good cook knows the best way to make a sweet food seem even sweeter is to add a little salt to it. Marrying salty smoke-cured bacon and sea salt to rich, thick dark chocolate could be a no-brainer. But how popular will it be? From what I read in an Associated Press article on Yahoo, the folks from Famous Dave's that came up with this creation weren't sure how it'd come across. I'm sure there's far more to the story, and I'll be checking out more in the coming days. Back here in Arkansas, Tom Lyons says there's more to talk about. "Thing is about State Fairs, the uniqueness of them -- people will try things they'd never try at a restaurant." The Arkansas State Fair runs October 10-19 at the State Fairgrounds in Little Rock. More fair food fodder, coming soon.